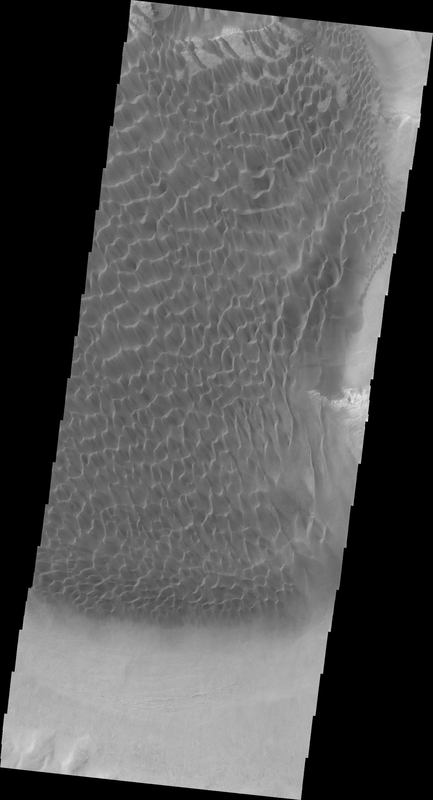 Dunes cover the majority of this image of Rabe Crater. As the dunes are created by wind action the forms of the dunes record the wind direction. Dunes will have a long low angle component and a short high angle side. The steep side is called the slip face. The wind blows up the long side of the dune. In this VIS image the slip faces are illuminated more than the longer side. In this part of the crater the winds were generally moving from the lower right corner of the image towards the upper left.